The Istituto Europeo di Design of Turin, one of the leading automotive design training institutions in the world, will present a preview at the Geneva International Motor Show 2007 of “beON”, a full size concept car, designed by the students of the 4th RSP Master in Transportation Design – work experience 2005-2006 course (the 5th course will start on April the 12th 2007), as well as offering this years audiences the opportunity to get another look at “M eleven B”, “Manta” and “MP 11”, the three models that were awarded prizes by McLaren Automotive as part of the thesis project developed by students in the Three year post-high school Transportation design – car design course for the 2005-2006. For the fourth consecutive year the IED Turin has confirmed its record of being the only School in the world to take part in the Geneva International Motor Show, the highest point of the Institute’s designing and creative process. The scale model (3860 mm long, 2100 mm wide, 1600 mm high, wheel base 2750 mm) stems from the decision to concentrate the research efforts of the Master course student on the search for a solution that might marry style with technology, hybrid propulsion with excitement. The result is a state of the art ecological vehicle with the potential to turn the dream of an unpolluted world into reality, without sacrificing the thrill of driving. Taking as its starting point the problems connected to the nature of hybrid vehicles and their somewhat unappealing image, due to their being perceived as being something more intellectual than emotional, the project set itself the challenge of creating a model that was not just “useful” but also aesthetically sophisticated, with startling lines and heightened potential, that might provide these kinds of technologies with greater visibility and appeal. The 19 students, led by the master coordinators Carsten Astheimer, Head of Design at Brunswick Boat Group and Luca Borgogno, a Pininfarina Designer, have come up with a concept car that clearly voices the ideas of freedom and movement, developed around a structure conceived to represent excellence in terms of functionality and originality. 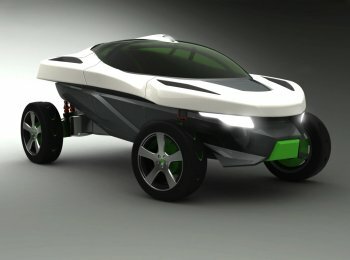 The vehicle, a two seater off-road sports car, has been designed to travel over deserts, beaches and wild terrains, as well as negotiating the urban jungles, offering its passengers the best interior comfort together with the opportunity of enjoying the view outside the cockpit; it’s ideally suited for travel in extreme conditions, allowing nature to be experienced with the maximum freedom and in the most adventurous way. The flowing exterior, embracing and protective like soft skin, changes shape and colour, creating empty spaces that emphasize the lightness and thorough enjoyment to be gained from the car. The see through sun-roof, made of glass and plexiglass, adds to the feeling of being completely immersed in the surrounding environment. For the mechanics, the choice has fallen on a hybrid thermal-electric engine connected to a very special hydraulic transmission system placed within each wheel hub. This ingenious combination ensures excellent off-road performance and seeing as it can also act as a break, it means that the traditional disk and calliper breaking system can be completely eliminated. 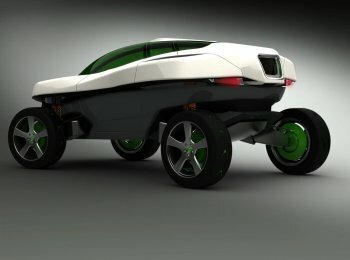 The Istituto Europeo di Design of Turin, one of the leading automotive design training institutions in the world, will present a preview at the Geneva International Motor Show 2007 of “beON”, a full size concept car, designed by the students of the 4th RSP Master in Transportation Design. For the fourth consecutive year the IED Turin has confirmed its record of being the only School in the world to take part in the Geneva International Motor Show, the highest point of the Institute’s designing and creative process. The model is the result of a complex selection process that included a number of different stages: out of the initial eighteen individual proposals, nine were then chosen to be produced in 1:4 scale models. The students worked on these as pairs or teams of three. A technical panel headed by the engineer Lorenzo Ramaciotti and made up of Dott. Giuliano Molineri, Frimark President, the engineer Costanzo Berta, Aerodynamics, aero-acustics and bodywork experimentation expert, Dott. Arrigo Gallizio, Segno Milano President, and the Master coordinators, was subsequently responsible for supervising the final selection that led to the choice of the final model, and also made suggestions as to possible ways in which the car could be further developed. “beON” is a project which was devised by: Jaywant Bharat Bhalla (India), Abhijeet Bhoge (India), Rishabh Chaturvedi (India), Anindya Dutta Roy (India), Pablo José Gaido (Argentine), Jesús González Torres (Mexico), Andrey Gusev (Russia), Matteo Krzanowski (Italy), Nemanja Lalicic (Serbia), Vincenzo Langella (Italy), Aldo Meli (Italy), Giorgio Olori (Italy), Emre Ozbilgin (Turkey), Jim Patané (Canada), Cagri Ahmet Selcuklu (Turkey), Gopal Tamaskar (India), Yogesh Yadav (India) and Sinan Yogunali (Turkey). The following took part in the project as tutors: Alessio Minchella and Dario Olivero, ex IED students. The model was created in collaboration with: Automotive Lighting, Model Resine, OZ Racing, Pirelli, Weiss S.p.A. (KONI shock absorbers). The model was built out of Cecomp. Besides the real scale model, the IED stand also presents ”M eleven B”, “Manta” and “MP 11”, the three prize winning models for the thesis project “A 320 km/h plus sports car” created by the Three year post high school course in Transportation Design – car design, commissioned by the prestigious car manufacturer’s McLaren. The aim outlined in the project brief was to create a road sport’s car capable of achieving speeds of over 320 km/h, that might offer it’s owner the top level of Formula 1 technological excellence in a road car, featuring unbeatable dynamic and aerodynamic performance. The three models, created in a 1:4 scale, were awarded prizes out of a group of 14 proposals from the class, made up of 39 students, that worked together divided into 14 different groups. The first prize was awarded to “M eleven B”, a project devised by Alessandro Belosio, Vito Possidente and Massimo Terranova, that successfully married power with lightness; the second prize was awarded to the “Manta” project created by Davide Amantea, Igor Fedorov, Ori Yemini, for their inventive combination of style and top performance; the third prize went to “MP 11” by Giuseppe Mariniello, Carlo Olivieri, Davide Valpreda for the strong visual impact of its shape and the purity of its British Style, a guarantee of elegance and understatement. The 14 supercars to be presented by the IED students are currently on show in the “Nothing is impossible” exhibition at the McLaren Technology Centre in Woking, having opened on the 4th of December 2006.